One of the longest-running and most challenging jobs of my career, I worked on the graphic design for Tales of the Arabian Nights for over a year. The game, a huge Choose Your Own Adventure book in boardgame form, is dripping with theme and a hell of a lot of fun to play, as you read paragraphs from the 300-page Book of Tales to determine your character’s destiny. Not the game if you’re looking for strategy and ‘winning’, but perfect if you like creating stories and laughing your head off, even if you end up a married, diseased, grief-stricken beggar at the end! 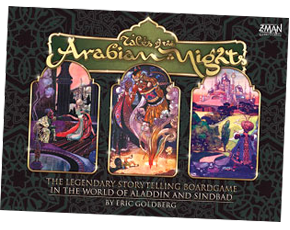 The link to the rules summary for “Tales of Arabian Nights” isn’t working … just a heads up. This game is fantastic with the right group! Sorry Ko, I just checked and they both appear to be working fine. Try again, or check to see if something is blocking ZIP file downloads at your end.